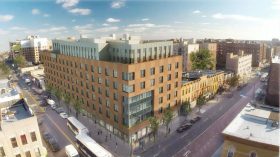 Applications are now being accepted for 51 middle-income apartments and The Clark, a newly constructed 8-story building in Prospect-Lefferts Gardens. 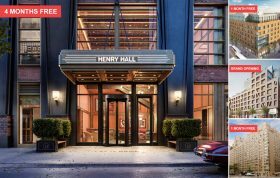 The Brooklyn building, located at 310 Clarkson Avenue just a short walk from Prospect Park, features a ton of amenities, including an attended lobby, in-unit washer/dryer, dog run, fitness center, a media room, co-working space, and a furnished penthouse space. Qualifying New Yorkers earning 130 percent of the area median income can apply for the apartments ranging from $1,525/month studios to $2,635/month three bedrooms.